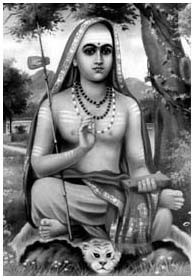 “HE who declared, ‘I will come whenever virtue subsides’ (Bhagavad Gita IV.8-9), came again, and this time the manifestation was in the South; and up rose that young brahmin of whom it has been declared that at the age of sixteen he had completed all his writings, the marvellous boy Sankaracharya arose. The writings of this boy of sixteen are the wonders of the modern world, and so was the boy.” —Swami Vivekananda (Complete Works: The Sages of India). The greatest philosopher of all times and the greatest Hindu of his time, he is generally supposed to have been born at Kaladi in Kerala (on the south-west coast of the Indian sub-continent) in A.D. 788. While one tradition has it that Siva was the family deity of Sri Sankara, another affirms that he was by birth a Sakta. Every page of Sankara's life scintillates with so much of spiritual wisdom, so much of logical subtlety and so much of philosophical profundity that for centuries, this boy, from his granite pedestal, will point out to all men the way to Blessedness and Peace, and ages hence, every traveller on the rugged path to the Highest Heaven will say in his heart, "The truest vision of the Supreme came, perhaps, here". Even as a boy he attended the Vedic school. His sharp brain went prying into the soul of the sacred Vedic Lore and formulated, with astute genius, accurate definitions and exact analysis, a synthetic philosophy. He renounced the world before his mind could be contaminated by its wiles, and embraced monasticism, dedicating his life to God-realisation and, also, to bringing back the Indian world to its pristine purity. Assuring his mother that he would be at her bedside at her last moment, this passionless recluse went in search of a teacher, who could formally initiate him into the mysteries of Sannyasa and show the way to the Supreme. At Omkaranath, on the river Narmada, Sankara found his guru in Govinda Bhagavatpada. He stayed with him exploring every facet of the Supreme Truth, and humbling himself in the modesty of Wisdom. In fulfilment of the mandate from his Guru to establish Advaita Vedanta as the meeting ground of all monistic and dualistic views, contradictory though they might appear to be, the young genius went to Varanasi, the ancient seat of Vedic religion and culture, and started spreading the gospel of Unity in diversity. He held disputations with the learned leaders of various schools of thought, and, by uncovering false assumptions and questioning assumed certainties, he established the supremacy of his system of thought. Here the first of his four disciples, Sanandana, later known as Padmapada, joined him. From Varanasi, the spiritual colossus journeyed on to Badrinath in the Himalayas with his disciples, spreading the message of his synthetic philosophy. He visited many holy places such as Prayag, Hardwar, Hrishikesh, Srinagar, Rudraprayag, Nandaprayag, Kamarupa and Gomukhi, worshipped the Deities on the way, and thus demonstrated that a knower of Nirguna Brahman [Attributeless Absolute Brahman] is not devoid of devotion to Saguna Brahman [Brahman with Attributes]. Here in the calm of the Himalayan heights, Sankara wrote commentaries on ten Upanishads, the Bhagavad Gita, and the Brahma Sutra, the triple canon [Prasthana-traya] of the Hindus, and established his doctrine on a firm foundation. He later also wrote a number of subsidirary treatises [prakarana granthas] to summarise the teaching, such as Vivekachudamani, Atmabodha, etc., as well as a number of hymns of philosophical and devotional content. His total output is nothing short of amazing, written as it was on palm leaves; — In the words of George Thibaut, German Indologist, “The doctrine advocated by Sankara is, from a purely philosophical point of view, and apart from all theological considerations, the most important and interesting one which has arisen ïn Indian soil;.. ”. Then he wandered about from place to place engaging himself in discussions with leaders of diverse creeds and sects, and, by his superb dialectic skill, he went on deflating false dogmas and puncturing erroneous presumptions. Tradition has it that it was during these peregrinations that Sankara met Mandana Misra, the greatest champion of the Mimamsa system which upholds Vedic ritualism as against the way of Self-knowledge and the monastic ideal. Sankara engaged Mandana in a disputation and, on defeat, Mandana became a disciple of Sankara with the name Suresvaracharya. Sankara travelled all over the length and breadth of the vast sub-continent four times, established four principal, still existing, monasteries at the four cardinal points of India, the Sringeri Math on the Sringeri hills in the South, the Sarada Math at Dwaraka in the West, the Jyotirmath at Badarikashrama in the North, and the Govardhana Math at Puri in the East, and appointed his four chief disciples as pontiffs of these Maths to promote the spiritual wellbeing of the monks and the laity within their respective jurisdictions. He also assigned to each Math one Veda. Thus Rig-Veda went to Govardhana Math, Yajur-Veda to Sringeri Math, Sama-Veda to Sarada Math and Atharva-Veda to Jyotir Math. Many obnoxious cults had vitiated the Indian society then, and temples were in the hands of a coterie of corrupted priests dabbling in hideous forms of worship and animal sacrifice. Sankara, with the help of scriptural evidence and his dialectic skill, proved that these militated against the very spirit of the Vedas. He reformed these corrupt practices by infusing into them the noble principles of Vedic worship and transformed them into means to Self-realisation. He reformed and reinstituted the worship of the six Deities [Shanmata]: Ganesha, Shiva, Shakti, Vishnu, Surya (Sun) and Skanda and demonstrated that ideas of image worship too had a place in the Vedanta philosophy. This is based on the belief in the essential oneness of all deities, the unity of Godhead, and their conceptualization of the myriad deities of India as various manifestations of the one divine power, Brahman. The whole object of worship is by constant struggle to become perfect, to become divine, to reach God and be God. His deep affection for his mother triumphed over the rules governing the Order of Sannyasins [Monks], and, on her passing away, he performed the funeral rites of his mother in the face of stiff opposition from his relatives. He passed away in Kedarnath on the Himalayas, at the age of thirty-two, according to tradition. It was Sankara's genius that organised the great body of wandering monks in India into ten well-knit orders —the Dashanami Sampradaya (named Saraswati, Bharati, Giri, Puri etc. )— and assigned them to the four mathas he founded. It is not without significance that Sri Ramarishna Paramahamsa, the Prophet of Modern India, was a disciple of Swami Totapuri Maharaj, who belonged to the line of Puris among the Dashanamis and that the monks of the Ramakrishna Order are, therefore, vitally linked with Sri Sankara. NOTE: At the same time, one cannot fail to see a parallel between Sankara and Swami Vivekananda, who also passed away early (at 39, in 1902), after leading a most active life of travel, reform and formally founding the Ramakrishna Order in 1896. In Suggested Reading (below), see article ‘Cardinal tenets of Shankara's Vedanta’, and other resources. There are three things which are rare indeed and are attained by the grace of God, namely, a human birth, desire for liberation and the protecting care of a perfected sage. Having by some means obtained a human birth and that too of a male body, and mastery over the Vedas, the foolish person who does not try for self-liberation, verily commits suicide, for he kills himself by clinging to things that are unreal. Among things conducive to liberation, devotion alone holds the supreme place. The seeking after one's real nature is designated as devotion. The dream is unreal in waking, whereas the waking is absent in dream. Both, however, are non-existent in deep sleep which again is not experienced in either. Thus all the three states are unreal inasmuch as they are the creation of the three Gunas; but their witness (the reality behind them) is beyond all Gunas, eternal, one, and is Consciousness itself. The world, though an object of our daily experience and serving all practical purposes, is like the dream-world, of the nature of non-existence, inasmuch as it is contradicted the next moment. The opposition between wisdom (Jñana) and work (Karma) is unshakable like a mountain… Bhagavan Vyasa taught his son conclusively after much reflection thus: These two paths are taught in the Vedas— one called the path of activity (pravritti) and the other, of renunciation (nivritti). As compared to the status of the supreme non-dual Self, even the gods, etc., are demons. And the worlds that belong to them are demoniacal. Sorrow and delusion are for one who does not know the cause of desire and action, and not for one who sees the one pure Self which is like unto ether. The wise man should, at all times, meditate attentively upon his own Self which, though unseen, is yet the only reality and though manifest as the external universe, is yet of a nature of subjective consciousness. That which is actuated by desire is the sole source of sorrow and becomes insipid in an instant. It is sought after by the ignorant. Everyone in all the three worlds strives for happiness and not at all for misery. The two sources of misery are the sense of 'I-ness' in the body and the sense of 'mine-ness' arising therefrom, in the objects of one's own consciousness. Through the knowledge of the inner Self which is Brahman, ignorance, which is the cause of transmigration and of desire and action, is removed without residue. To get liberated is to discard the ideas of 'me' and 'mine' in all respects and to get convinced in the realisation of the Self. A dream is a simple mental imagination and is unreal inasmuch that it is not seen in the next moment after its existence. One who in dream, sees things good and bad, high and low, favourable and fearful, thinks that they are actually real, and never for a moment thinks that they are unreal while dreaming. Even so is this world till the dawn of Self-Knowledge. The Lord is never unjust and unmerciful to His creation. He who while fully anxious about his body, desires to realise the Self, prepares to cross a river on the back of a crocodile mistaking it for a piece of wood. One may have bathed in the holy Ganges or even in the Ganga Sagar (its source); he may have performed many charities and observed many vows; yet unless one has glimpsed the Truth (God), he will not gain release even after a hundred lives. Wherever my mind is, let there be Thy form; wherever my head is, let there be Thy feet. Do not look at anybody in terms of friend or foe, brother or cousin; do not fritter away your mental energies in thoughts of friendship or enemity. Seeking the Self everywhere, be amiable and equal-minded towards all, treating all alike. In you, in me and everywhere, there is but the one Vishnu, Mistakenly viewing me with a sense of difference, you are ill-disposed towards me. Try to see in all beings only the Vishnu who is your own self. Give up your false and egoistic sense of separateness from other beings. Cultivate a sense of kinship, unity and oneness with all. It is owing to people's worldly desires, their desires for scriptures, and their desires concerning their bodies that they do not achieve realisation. Only he who is free from the terrible hankering after the senses which is so hard to overcome is fit for liberation, and no-one else, not even if he is an expert in the six branches of scripture. Liberation is achieved not by observances or by analysis, nor by deeds or learning, but only by the realisation of one's oneness with God, and by no other means. ‘Cardinal Tenets of Sankara's Vedanta’ provides a summary of Shankara's Vedanta by a very profound thinker, Swami Satchidanandendra Saraswati — from his booklet ‘Salient Features of Sankara's Vedanta’ (Pub. Adhyatma Prakasha Karyalaya: for URL see Books 3rd item, below). Some Modern Views on Sankara by Prof. C.T. Srinivasan. Clarification of misconceptions on causality by Eastern and Western philosophers, etc. Mandukya Upanishad – Some Notes by Swami Siddheswarananda. The philosophy of the Totality of Existence. Kashi Panchkam of Sri Shankaracharya by Swami Tattvavidananda (tr. & commentary). Dakshinamurti Stotra of Shankaracharya by Prof. V. Krishnamurthy (tr. & commentary). 1. Goto Library ‣ Books ‣ Upanishads, Gita, Brahmasutras—for translations of commentaries & other works. ‘Adi Shankaracharya’ — Biographical film (1983), Sanskrit with English subtitles. Goto Library ‣ Multimedia for link to Youtube.